Near Craven Cottage there is a bookstore after my own heart. When I walked in, I thought it would be completely disorganized. However, I learned that they had the books divided into sections and spreadsheets for all the different sections, including authors, titles, and genres. I was pretty impressed. Unfortunately I could only browse since I was on my way to a football match and I didn’t want to lug any books around. But, I’ll be back! This entry was posted in Books, London and tagged Craven Cottage, England, London, Photography, Shopping, Used Books, Used Bookstores. Bookmark the permalink. That looks like Heaven to me and I love the sound of the spreadsheet. This was a fantastic find for a book lover! And the organization was the cherry on top. Wonderful! This looks like a perfect place for a tearoom. Love books. I ave six large book cases full of them. Like how these are stacked. That is a lot of books. I only have five large book cases right now, but I hope to expand my library over the years. However, mine aren’t stacked this this. I’m trying to guess how many books you have, but I can only come up with a lot. Math was never my strong suit 🙂 I’m jealous! Looks like a great place to spend a rainy day! Yes! Add a cup of tea and it would be perfect. Reminds me of Powells bookstore back home in Portland, OR. Hope the reading is going well. Dang! I was in Portland a few years ago and I missed Powells. I’ll have to go back! I love books and I would like to be organized. I’m good at buying books, but I really struggle in the organization part. Maybe I could learn from this store. Come on over! I’m organizationally challenged. Every time I figure out a system I decide to change it. I try to divide it up in sections, but then I can never remember how I came up with the sections. How are you with sweaters? My clothes closet is also a disaster. No challenge is too great!! Oh the poor customer! How embarrassing. I hope no one was hurt. This store also had books stacked up and I was a little nervous to touch them. But the guy offered to help me if I needed anything above my head. If I had more time, I would have taken him up on the offer just to see how graceful he could be. I’ve always wanted to own a bookstore, but I fear I would never make any sales. I wouldn’t be able to let go of them. Good luck reading this year! 🙂 It is a happy place. Heaven! How I miss independent booksellers. They are disappearing so rapidly in the States. I know. It saddens me. I wish I could be there most of my time! 😀 Thanks for sharing, TBM! what a fabulous bookstore to come across! Ow my…what a heaven for book lover. I would for it to be right next door, but I may never leave. Sounds amazing. And very impressive that they are so organized. Pretty rare for used bookstores. Can’t wait to see what you discover when you go on an actual shopping visit. I can’t wait either! I was surprised. They were more organized than most stores I’ve been to. Would love to browse around that shop! Don’t have very many near where we live. The few good ones are being torn down to make way for malls! That is awful! I would much prefer bookstores than a mall. Me too, but who can stop “development” ? I know…sometimes I feel so helpless. I’ll have to write the title down. I keep a wishlist of books in my wallet since I have a horrible memory. I would love to find it. And now I want to visit the Green Apple! I also love to visit bookstores when I travel. It is a great way to get to know a place. 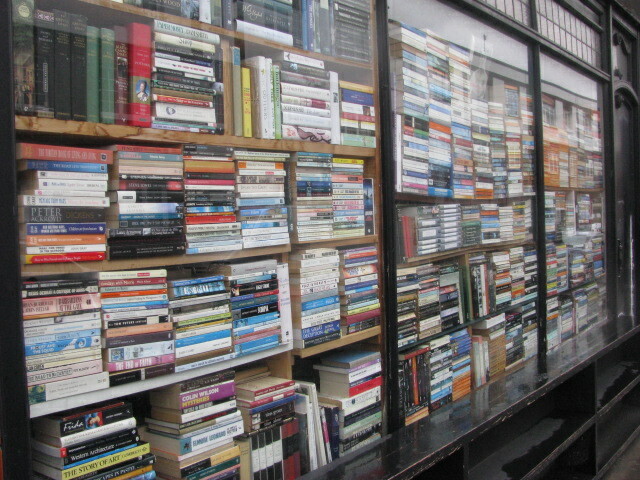 To see the books that are popular and to get a sense of the culture. You can learn a lot. And of course I like to pick up some. This makes me incredibly jealous and definitely makes me want to come back to the UK! While you’re there you should make a point of going to the Hay-on-Wye (book/literary) festival and take lots of pictures! I want to live vicariously through you. Thanks Geoff! I’ll have to look into it. And if I go, I promise to take pictures. Thanks for the tip!